FLITON - AJ Extra 330S "Build thread"
RE: FLITON - AJ Extra 330S "Build thread"
You know, I sure like the looks of this plane, so I am really happy with this thread. I haven't got a clue since when this plane is on the market but I would sure like to hear some more comments of people flying with it now! Also any alternative setups (servo's, motor, receiver etc.) are very welcome! Hey papajeff, one of my AJ Extras is pictured in the September issue of Flying Models (I also think I am flying the monocoupe on the cover, my nieghbor and I were taking turns flying it). Look at the VR/CS coverage, page 68. We have a gentleman from the Netherlands who is interested in how the AJ performs and would like to hear about some different set-ups. Since you have the experience, I thought you would be the one to give Volkert some good old USA information. Thank you for your interest in the AJ Extra. Here in the US, Fliton has had this model since the beginning of this year and it has been very well received. 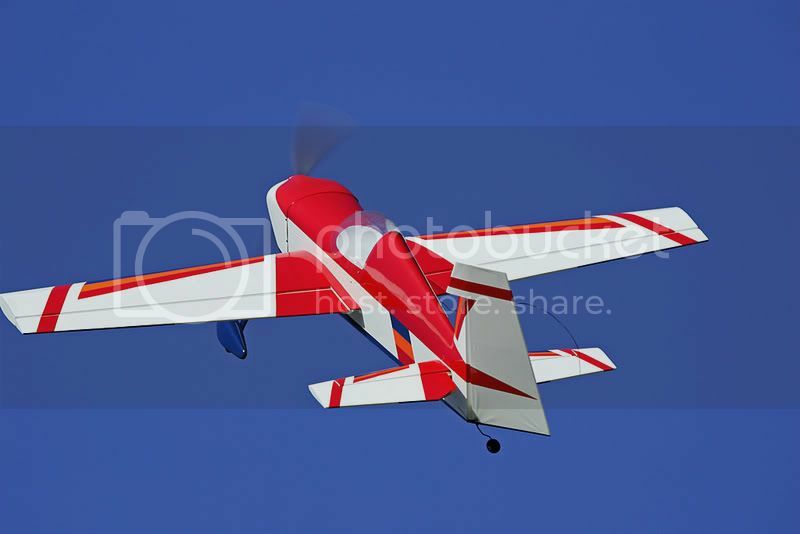 You can get some good information from the Fliton web site at www.flitonstore.com (thanks to Huckinstix) and I'm sure that we can find a video of the AJ doing some 3D flying. I will post the link as soon as I remember where I saw it. You can install the landing gear and the included landing gear cuffs at this time. The cuffs are optional and were used as it gives a more finished scale appearance. Just remember to make sure that the landing gears sweep forwardwhen they are installed. It's a good idea to mark them R & L, with a felt marker, so that they will certainly be installed in the proper direction as you trial fit the cuffs. Nylon screws and bolts are great in some applications, however, for landing gear it just seems reasonable to to usemetalscrews to give a very SOLID attachment! The fiberglass landing gears will reduce the stress of a slightly less than perfect landing........which some of us are known to have on a very rare occassion, right??????? hello PapaJeff, thanks for the info. I saw the video's, great stuff!!!!! Love it. I have been flying the "bigger" Flitons sofar (Inspire, Infinity). Never got myself to convert to electric, buttttttt this one might do it! Anyway, as said before, any tips on power setup are surely welcome! This is the content of the combo pack Fliton suggests on its website. I compared this to the setup shown earlier in this thread, seems pretty much the same (as far as this glow fuel flyer can judge!!!!!). Difference seems to be the size of the battery pack. What is the difference in flight time with a 2100 mAh vs. a 3300 mAh?? Any other issues? I like the light-weight set up. HS-65's, 3S 2170 Evo's, AXI 282012,APC 13X6.5e,Castle 45. Kevlar pull-pull. Not ballistic power,, but plenty to 3-D. Pretty stock airframe, steel lg bolts, Deans connectors at the cowl opening, no need to remove hatch. I think I'll go ahead and sticker this one up! I would like to know how he reinforced the "wood dowel" that joins both elevator sections. I was considering a carbon fiber rod, but decided to use the standard parts that came with the AJ. I would like to know how he reinforced the "wood dowel" that joins both elevator sections. Bone stock there,,,, Works just fine. PS !! I own page four!!! Dowel construction looks funny at first, but works well with the Inspire-60. I wouldn't worry too much about it! Well, as mentioned at the pre-order thread, I thought should I order one, or not.....SO I ORDERED TWO!!! One combo with HS-65's and a seperate one. I wonder what import taxes I have to pay, but we'll see about that later. For now, I am a happy camper. Anyway, just bought a new house so I guess the wife won't really know the difference in the mortgage!!! Jippie!!! Thank you for your info on the elevator joiner and, of course, your valued contribution to the build thread. I better get this AJ ready for Devin to fly at the upcoming NEAT event....................so now it's INSTALL YOUR SERVOS time. The wing servos (HS-81's) fit the servo bays with just a little bit of sanding with an emery board (yes, my wife is missing a few) to slightly inlarge the opening. Notice that the servo wire is just the right length and will exit the wing roots with more than enough to spare so you will only have to use a short "Y" harness to reach your receiver. The elevator servo (another HS-81) also needed the slightest bit of sanding to allow it to fit flush in the servo bay on the right side of the fuselage. Add a 12" servo extension to the servo wire and pass the wire through the fuselage formers towards the nose of the plane. Now, fasten the servo with the provided screws and make sure that the servo fits securely into the bay and flush on all sides. Notice that the servo will sit slightly recessed and this is the proper position that you want to achieve. And, finally, the pull/pull rudder servo, which needed a bit of reinforcement. It was easy to CA a few short lengths of "triangle" stock to the transverse sticks that support the servo bay (or ply cut-out in this case). First, the "servo bay" was removed and then the triangle stock was added. Then, two more "square stock" sticks were added.....just to make an "OLD GRANDPA" feel a little more secure! An HS-85BB was used to control the pull/pull rudder to give a little extra torque when required. Also, a long super strength servo arm from DU-BRO was used. Have enjoyed reading through your thread and finding another old fart willing to learn something new, as opposed to being stuck in the mud. After reading the thread and having this model recommended to me by one of the respected national flyers, I ordered mine from Fliton. I stayed away from their packages due to not knowing the quality of their battery packs, and am not willing to put this bird at risk with unknown batteries. Have been a TP guy for a number of years with nothing but good to say about them. They are pricy, and this bird appears to need something in the 3300 mah range to get over 10 minutes of flight time. Have been looking into a USA product "MaxAmps" and their prices seem a lot more reasonable. Do you, or any of the guys out here have any experience with them???? Like said earlier, electric will be new for me. I was wondering on this size airplane what would be a good receiver to use. I am a Futaba flier, and on my bigger planes I use a R149DP PCM. This is 33 grams. On a website of a European Fliton dealer they suggest Jeti Rex 5 which is only 8 grams. But this is probably not PCM and I don't know if this will not result in glitches. Suggestions are again welcome! Thank you for your comments and for sure, us "OLD DOGS" can learn some new tricks and we all have to stick together, right! You can't go wrong by using TP (Thunder Power) batteries as they are excellent! I am aware of MaxAmps, but I have no personal experience with them as of yet. I do know that FlightPower batteries have become very popular and can be acquired thru Great Planes. There is a good review by "Dr. Electron" (yes, he's a pal), Greg Covey.....http://www.rcuniverse.com/magazine/a...article_id=883, which may interest you. I also agree with you regarding the Electron 6 receiver and the Berg 7P from Castle Creations. They are both excellent products and function properly. Lately, I have been going nuts over the Spektrum 2.4 system and with my DX-7, I have been converting over most of my planes. Their receivers (6100...the new 6200 6-channel, the 7000 and the new 9000) are beginning to become extremely popular! The beauty of 2.4 is that you basically never have to worry about any interference, glitching, and whose on what channel, in addition to a very strange kind of connected control feeling that I have not experienced with conventional 72mhz. aircraft and are not overkill! The elevator was first and the install was "cake" as Fliton has beefed up the internal stucture of the elevator, rudder and ailerons to provide a firm and strong attachment point for a variety of control horns. will attach to, should be positioned at the hinge line to give total control to the moving surfaces. Well, I just had my mind made up for me........and at my advanced age.....that really eliminates stress! It seems that Edson (Flitons Guru) and Hacker had decided that this build should include the A30-10XL brushless motor with the Hacker X-55 X-Pro ESC. The reason that I know this is; my friend, who always dresses in BROWN and drives this big BROWN box of a truck and is always yelling at me as he speeds down the street; "Hey, old man, you want to race the truck???????? ?," dropped off a package that contained these two Hacker items. So, in answer to some of the questions about power set-ups, this is it! Ohhhhhhhhhhhhhhhh.......Yeahhhhhhhhhhhhh!!!!!!!!!! !!! !